1. Heat a dry frying pan, add the rice and dry-fry, stirring now and then, until golden but not burnt. Grind the rice in a clean coffee-grinder or pound to a powder and set aside. 2. Reheat the frying pan and add the dried red chilli. Dry-fry until smoky, then grind or pound to a powder and set aside. 3. Dissolve the sugar in the lime juice and fish sauce. Combine the ground rice and set aside. 4. 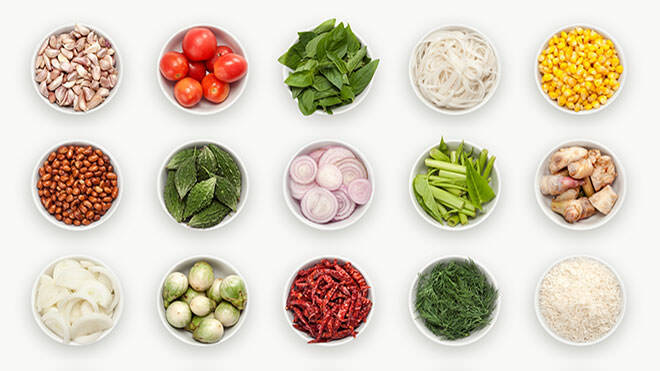 Combine the cucumber, shallots, cherry tomatoes, red chillies, herbs and spring onions in a large bowl. Add the fish sauce mixture and toss to combine. 5. Mix in the ground rice and sprinkle the herbs over before serving.